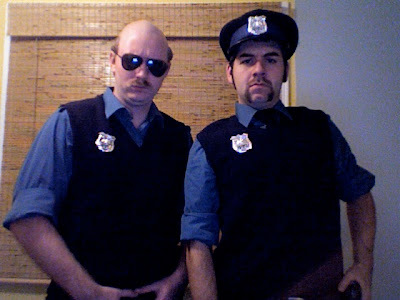 Good cop bad cop, Second Lieutenant Andy Coyle and First mate Louis St.Pierre arrived at Fatkat yesterday unannounced. Lieutenant Coyle marched around shadowing nervous suspects while Officer St.Pierre followed behind passing out cookies to make up for the shaking boots. It takes some real kahoonies to barge in past security at Fatkat. It takes even Bigger Kahoonies to shave your beard and moustache into that ridiculous spectacle on Coyle's head.